Landscape: Hilly with dense forest. Coast indented with many coves, small beaches and reefs. 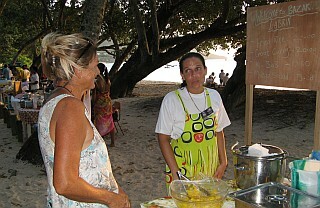 Visited: 5 July to 23 September 2007 except for a couple weeks spent in La Digue and Praslin. Be sure to check out our Seychelles Newsletters for more of our stories and photos! Cruisers, see our Seychelles Cruising Info page for all those other details. 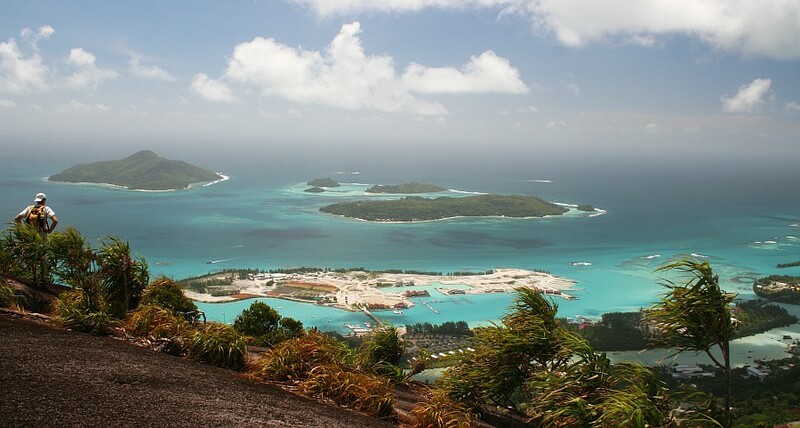 (Sue) Mahé, where 90% of the Seychellois live, is the largest of the inner islands and home to Victoria - one of the smallest capital cities in the world. We spent many fun days anchored in the yacht harbor near the Seychelles Yacht Club, which was convenient for dinghy landing, beers, socializing and showers. The Yacht Club is central to the whole town with its small shops that sell just about everything in one place, a few well stocked grocery stores, the lovely churches, mosque, Hindu temple and the internet "cafe" run by the phone company. The National Museum was worth the hours we spent there learning about the history of the islands and the (now forbidden) practice of gris-gris, a form of sorcery. Although most of the Seychellois are Roman Catholic there is still a thriving business for the medicine men and women who practice cures for curses and create potions for love, prosperity, etc. Luckily we had no need of cures other than for a broken tooth filling -- for which Jon went to a bona fide dentist. The standard of living of the whole country was far above what we expected with most everything imported, which meant that things (other than transportation) were quite expensive. 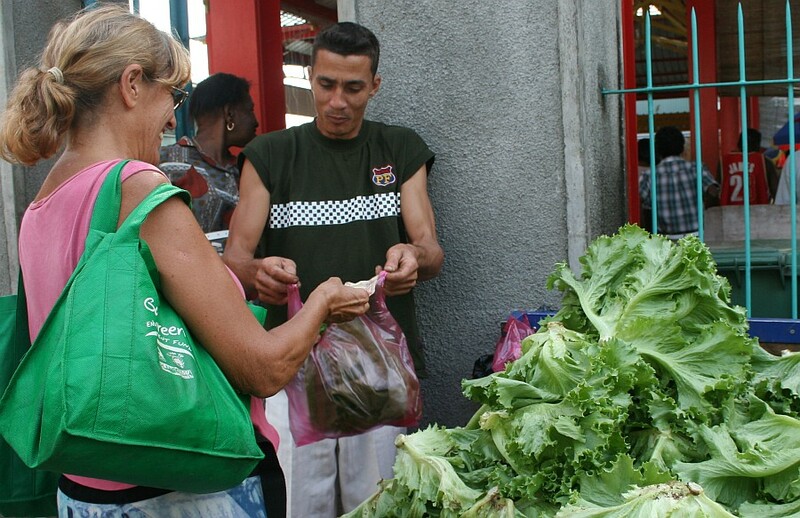 We got around this by eating simply, living on the affordable foods like fish and chicken and locally grown veggies. Every Wednesday evening the beautiful beach at Beau Vallon (a couple miles from Victoria across the island) held a street fair visited more by locals than tourists. If we were anchored in Victoria we'd take the bus over, or if we were anchored in Beau Vallon we would dare the surf to take our dinghy ashore. There, under the lovely Takamaka trees we would snack our way through suppers of rotis filled with curried calamari, fresh passion fruit juice and barbequed shish kebabs served with a bowl of tangy mango salad. From Victoria we could catch inexpensive buses to all corners of the island. Just outside town the hills rise precipitously above the old wooden homes with their iron roofs and the forests are home to wonderfully colorful birds such as the bright red Madagascar fody and the shimmering sunbirds. In the trees and bushes by the harbor a colony of Grey Herons squawk and fluffle in the early morning and evening. (Amanda) I loved the Seychelles, though seeing people and shops and cars and buses after two months of pristine Chagos was a bit of a culture shock. We immediately met a South African cruising boat (Lara Pinta) with 3 girls onboard who had just come up from Madagascar, so we spent a fair amount of time exploring small Victoria together by foot. We also took the bus across to Beau Vallon beach for swimming, beaching, and the Wednesday evening street fair. There we met many teenagers from the International School (mostly South African) who were conveniently on holiday. There followed many days of wakeboarding, swimming, lounging on the beach, bodysurfing, beach-soccer, more wakeboarding, avoiding jellyfish, and generally hanging out. I also spent several days on Lara Pinta down in Anse a la Mouche, exploring the southern part of Mahé. Okay, it wasn't all fun and games. But the sudden inundation of people my age to hang out with is what sticks in my mind from the Seychelles. I also had school work to do, and a lot of boat work. And we took a lovely hike, up to Kopolia above Victoria. Mahé is well-known for its hikes, and I would have liked to see more of the brilliant views from on high. Cruising friends of ours hiked the island flat. The hike to Kopolia was nice and moderate, cool in the shade of the forest, and we only got lost once, when we found ourselves on the side of the cliff that we were supposed to be on top of. A bit of backtracking sorted us out, and we got wonderful views of the east coast of Mahé and the islands of Ste. Anne Marine Reserve. Several long-tailed tropicbirds made fun of our lack of wings by playing in the air just in front of the cliff we stood on, and skinks came out to sun themselves as we had our snack of Coke and chocolate bars. (Jon) Our arrival at the Seychelles coincided with 3 of Ocelot's systems needing work - our headsail roller-gear rusted out its bearings (only 3 years after getting a full service), our sail-drives needed their seals replaced, and the watermaker membrane died. There were no watermaker parts to be had, so we had to have a new membrane flown in. Luckily, this is fairly easy as the Seychelles doesn't charge duty on goods marked "In transit for yacht Ocelot". After talking to several machinists, we found an excellent father and son outfit to repair the roller gear. They looked at how the water had gotten into it and upgraded those seals so they shouldn't leak again. They also sleeved many of the aluminum bearing surfaces in stainless steel, making the whole bearing and seal assembly even better than new. Working on the saildrives required hauling Ocelot out of the water, which is always a nerve-wracking time for a boat owner, but the the machine shop handled it adroitly and all seals and bearings were replaced in less than a day. All of this took time, mostly because we were also enjoying and getting to know Victoria and the rest of Mahé Island. Friends rented a car and we all toured the island, stopping at a tea-plantation(!) high in the hills, the ruins of an old school for rescued slaves, and having a delightful lunch at a beach restaurant. We went on several long hikes up through the lush vegetation to get to stunning views over the town and neighboring islands. And, as always, we poked around town, seeing what sorts of things were available and talking to the local townspeople. All good fun.